The seventh major installment in one of the most famous fighting game series developed by Bandai Namco Entertainment, which originally launched back in 1994 on the first PlayStation. 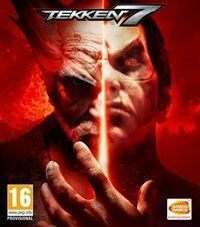 Tekken 7 for PC, PS4 and XONE is the seventh installment of one of the most popular fighting game series developed by Namco (currently Bandai Namco Entertainment) ever since the series inception in 1994. The game was initially released in March 2015 in Japan on arcade machines. A year later, an improved version (new arenas, characters, costumes, items, gameplay improvements) known in Japan as Tekken 7: Fated Retribution was reales on arcades once again. It was the base of the console, and for the first time in history also PC, verion of the game. Tekken 7 has one of the darkest stories in the history of the series, very close to the one from the 2002 Tekken 4 in that respect. As usual, we take part in the King of the Iron Fist tournament. Between the battles, we will learn the dark secrets of the world of Tekken, including the family feud between Heihachi Mishina, his son Kazuya, and grandson Jin Kazama. Originally being an arcade game, Tekken 7 for PC, PS4 and XONE (unlike the Tekken Tag Tournament series) focuses on one vs. one duels. They take place on special arenas where we can use the elements of our surroundings. There are 36 playable characters (20 of them appeared in the original arcade machine version) among which we will find both fan-facourite fighters and completely new ones. The game introduces two new gameplay mechanics. The first one, Rage Art, allows us to deal a series of critical hits that can take up to 30% of our opponents health points when his health bar is close to zero. The second one, Power Crush, allows us to continue our attack even if we were hit and thrown off balance by our enemy. A so-called Screw Attack also appears in the game. If we use it on an opponent who jumped, they are thrown tho the side and we can deal more damage to them when they land. The movment mechanics was also slightly improved (it is now similar to the one from the free-to-play Tekken Revolution). Tekken 7 for PC, PS4 and XONE offers a couple of unusual single player and multiplayer game modes. Story Mode is the most complex one. It has cutscentes and dialogues that slowly reveal the game’s plot to the players. It has to be mentioned that Bandai Namco decided to forgo the crossplatform multiplayer between the console and PC players, using cheaters and PC players’ poor reputation as the reasons. In terms of visuals, Tekken 7 for PC, PS4 and XONE is a big step foraward in comparison with the series’ previous installment. For the first time in the history of Tekken games, developers decided not to create their own game engine and use Uneral Engine 4 instead. Thanks to that, porting the game to other platforms is much easier, making Tekken 7 appear on PCs.